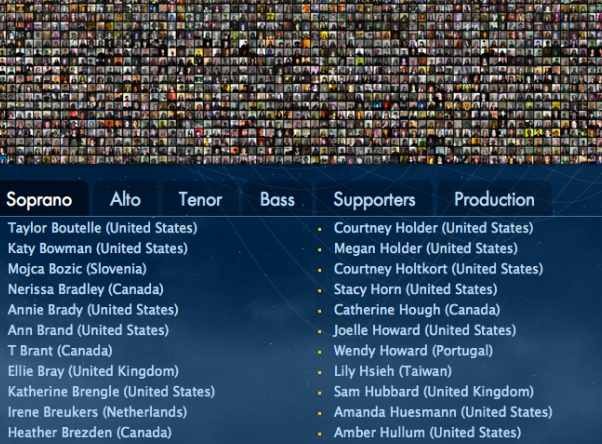 In January I submitted a video of myself singing for Eric Whitacre’s Virtual Choir 3. They got 3,746 submissions from 2,945 people in 73 countries, and I was one of them! Believe it or not, I actually went through the picture below and tried to find myself (I failed). But I’m in the credits so I’m in there somewhere. The Choir will premiere on April 2nd at Lincoln Center. I’m trying to get tickets, but they say there will be a live webcast for people who can’t be there. I’ll post details when I have them. By my count starting at left side top, you are 14 to the right and 9 down. You have to be joking!! OHMYGOD, you’re not. There I am!!! Thank you!!! I could not miss such a lovely lady. Aw, thank you. I’m a little bit frightening looking lately. Thank God I’m not as vain as I thought I was. I think the guy just above you is kinda frightening looking, however. Ha. I feel for all of us though, because we didn’t get a say as to which frame go captured and used.